August 29, 2018 – Los Angeles – Los Angeles Wolves FC knows the team it will face first as the qualification process begins for the 2019 Lamar Hunt U.S. Open Cup. 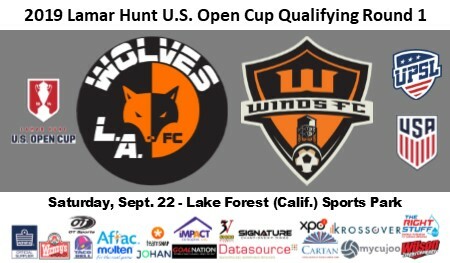 L.A. Wolves FC plays Santa Ana (Calif.) Winds FC at 7 p.m. PT on Saturday, Sept. 22 at Lake Forest Sport Park (28000 Rancho Pkwy, Lake Forest, CA 92630) in Qualifying Round 1 for the next U.S. Open Cup tournament. L.A. Wolves FC President Yan Skwara said, "We are honored to be participating in the Lamar Hunt U.S. Open Cup for the fourth consecutive year, and it's a pleasure to see us matched up against Santa Ana Winds FC in the tournament. The club continues to work hard to in both league and cup tournaments and our approach to this game will be no different. We want to win." The last time the two teams met L.A. Wolves FC narrowly lost, 4-3 in a shootout, to Santa Ana Winds FC in a UPSL Pro Premier 2018 Spring Season Western Conference Playoff Game on July 22. "The L.A. Winds FC-Santa Ana Winds FC rivalry is one of the best in all of Pro Development soccer, and we couldn't think of anything better than having to play Winds in a U.S. Open Cup match," Skwara said. "Both clubs are going to put on a good show." L.A. Wolves FC finished second on the Pro Premier Western Conference 2018 Spring Season table, and recently defeated Cerritos (Calif.) College in a closed door preseason friendly. The UPSL 2017 Spring Season champion, L.A. Wolves FC joins 36 fellow United Premier Soccer League teams attempting to qualify for the 2019 Lamar Hunt U.S. Open Cup. It will be L.A. Wolves FC's fourth consecutive appearance in the Lamar Hunt U.S. Open Cup Qualifying Rounds. L.A. Wolves FC are an American soccer club based in Los Angeles, California. We are named after the Los Angeles Wolves (https://en.wikipedia.org/wiki/Los_Angeles_Wolves), which played in the United Soccer Association (https:/en.wikipedia.org/wiki/United_Soccer_Association) in 1967 and the original North American Soccer League in 1968. L.A. Wolves FC is a charter member for the United Premier Soccer League (UPSL) and competes in the Pro Premier Division Western Conference. The club also manages a reserve squad and oversees L.A. Wolves FC Youth Soccer Program.